The Federal Reserve reaffirmed its 2018 projected path of an additional three 25 basis-point rate hikes at this week’s Open Market Committee meeting. I wrote last week that the announcement set the stage for an inversion of the yield curve by the end of next year. This “yield curve will invert in 2018” story rose to prominence in recent weeks as many analysts made similar predictions. Where did this forecast arise from and under what conditions will it come to pass? Why might the yield curve steepen instead? Is The Fed Finishing 2017 On A Dovish Note? The December FOMC meeting ended largely as anticipated with a quarter point rate hike, making the Fed good on their expectation of three rate hikes for 2017. What about 2018? The Summary of Economic Projections revealed that the median policymaker still anticipates another three rate hikes in 2018. But will they deliver? 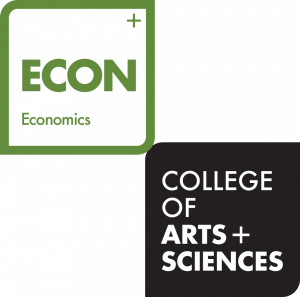 The answer to that question depends, of course, on the actual evolution of the economy relative to policymaker’s expectations. But at this point, I wouldn’t bet against them on the dovish side. There were two key changes in the median forecasts for 2018. The year-end unemployment projected was revised down to 3.9 percent from 4.1 percent while growth was revised upward from 2.1 percent to 2.5 percent. Remaining 2018 forecasts stood unchanged, as did the longer-run estimates. Funds rate revision = neutral rate revision + (1.5 × inflation revision) – (2 × unemployment gap revision). they show that a widely used policy rule can explain the change in the Fed’s 2016 rate forecast. 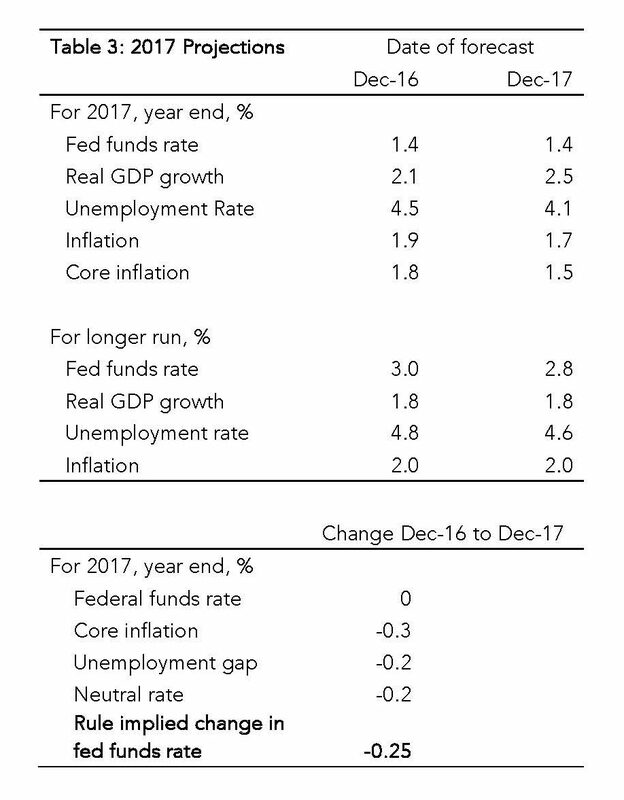 Table 2 follows the Nechio-Rudebusch methodology of comparing the current forecast for year-end 2018 with the forecast from last December. Using the rule followed by the Fed in 2016, the projection for the federal funds rate projection for 2018 would have risen 45 basis points over the course of 2017, driven by an increase in the magnitude of the unemployment gap that outweighed downward revisions in the inflation and neutral rate forecast. Instead, the 2018 revisions remained unchanged at equivalent of three 25 basis point rate hikes. 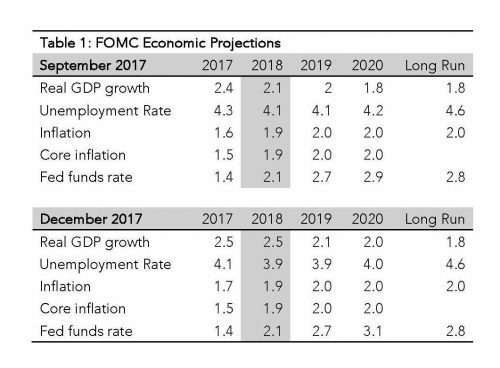 An important implication falls out of this analysis: Relative to the 2018 economic forecast changes, the projected path of policy is dovish. This can be explained by the surprising inflation weakness over the past year. Policymakers now believe a return to full employment requires an extended period of activity in excess of that consistent with full employment. Now, one might reasonably conclude that if the Fed holds a dovish rate forecast, then the risk is that they are more likely than not to fall short of their expected three rate hikes in 2018. Indeed, given the persistence of weak inflation, this seems on the surface like a safe bet. I would be cautious, however, of such an interpretation. 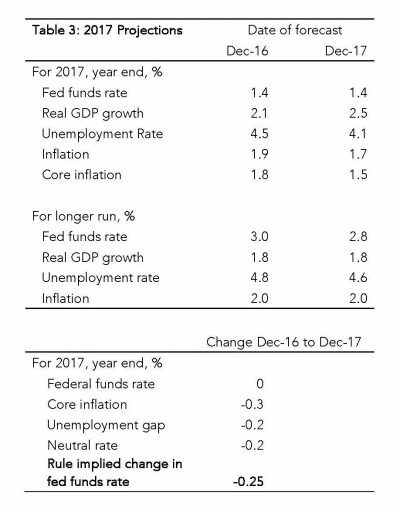 Note that using the same analysis (see table 3), the Fed would have reacted to the sharp downward revisions in the 2017 inflation and neutral rate forecasts by skipping the December rate hike. In other words, the Fed ran a hawkish policy in 2017 relative to changes in the economic forecast. The lesson: The Fed could very well ignore another inflation shortfall in 2018 and instead hold true to the projection of three rate hikes. This will be true as long as they can write-off any inflation weakness as temporary and thus see an inflation rebound in 2019. Also in favor of the Fed’s rate forecast is the likely direction of error in their unemployment forecast. The unemployment forecast is fairly nonsensical. 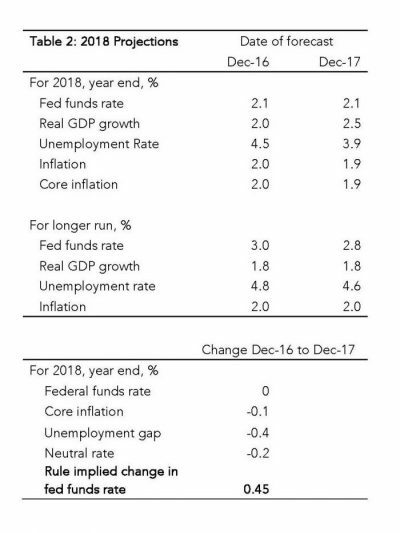 Back in September the Fed predicted a 2.1 percent growth rate in 2018 would drive a 0.2 percentage point decline in the unemployment rate. Now they expect a 2.5 percent growth rate delivers a decline of the same magnitude. Something does not add up. Perhaps they will claim that faster growth would be possible with a temporary boost to labor force participation or a reduction of underemployment. This runs opposite, however, of their post-FOMC statement, which claims that the labor market will simply remain strong, rather than strengthen further. 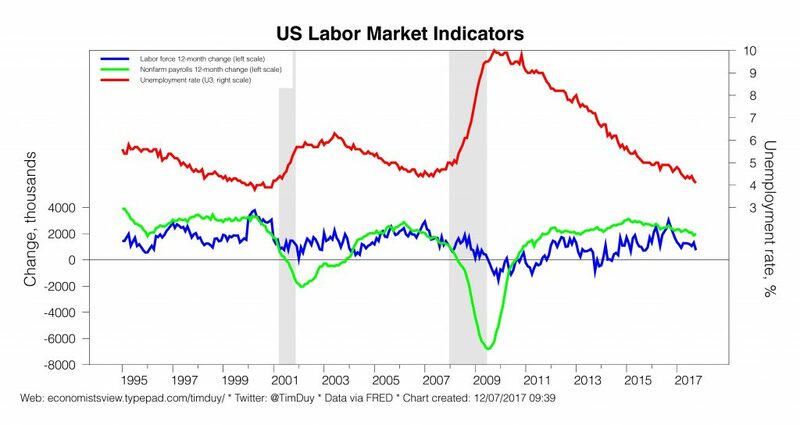 Without a substantial improvement across the labor market, it seems unlikely that the economy will run at a pace 0.7 percentage points above potential growth yet unemployment will only decline 0.2 percentage points. After all, unemployment in 2017 so far fell 0.6 percentage points on back of the currently projected 2.5 percent GDP growth rate. In the context of the Fed’s stated view on labor markets, the unemployment forecast makes sense only if you they expect a productivity boost. But no such boost is evident in the longer-run GDP forecast, which was unchanged. And I suspect that a higher estimate of productivity growth would be met with a higher neutral rate estimate and thus wash out in a rate forecast. So what this tells me is that the Fed’s forecast implicitly anticipates a temporary productivity boost. Watch for that. But if I had to bet on the Fed’s unemployment forecast, I would bet that it is still too high. If it comes in lower than expected like in 2017, it will again weigh against any inflation shortfall. Finally, look at the distribution of dots in the Fed’s infamous “dotplot.” Six of the dots are below the median projection, compared to four above. “Aha,” you say, “clear evidence of a dovish Fed in 2018.” Be careful there. Three of those six dovish dots are defnitely Bullard, Evans, and Kashkari, and I suspect a fourth is Kaplan. All four are nonvoters in 2018. What about the remaining two dots? One is likely Brainard. Will she still be on the FOMC by the end of the year? I am not confident of that; not sure she how closely associated she wants to be with this administration. And is the final dovish dot Yellen’s? Obviously, she is departing. At least four and very possibly all of those six dovish dots will not be voting by the end of 2018. So, while the distribution of dots looks dovish, it really is hawkish. Bottom Line: Don’t read too much dovishness into the outcome of this FOMC meeting and expect the Fed will easily drop from three to two or less rate hikes in 2018. The Fed’s rate projection is already arguably dovish, the unemployment forecast is subject to hawkish errors, the Fed ran a hawkish 2017 policy, and the voting members of the FOMC turn decidedly more hawkish in 2018. I continue to believe the Fed will have a hard time deviating from their projected path until economic activity in general, and job growth in particular, downshift to a lower speed. The GDP growth forecast, however, keeps moving in the opposite direction. As the Federal Reserve prepares to hike interest rates at this week’s Open-Market Committee meeting, market participants are bidding up short-term rates — moving toward the Fed expectations of more increases in 2018. That move could continue when the central bank reaffirms its commitment to further tightening next year. 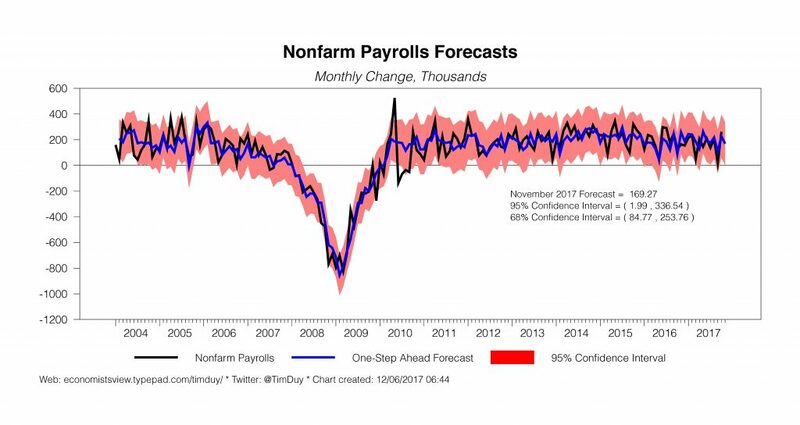 The consensus forecast expects a nonfarm payroll gain of 190k in a range of 153k to 250k. This strikes me as a reasonable expectation consistent with my forecast: Market participants anticipate the unemployment rate holds constant at 4.1%, with a range of 4.0%-4.3%. To be sure, a decline in the unemployment rate would deepen overheating concerns on Constitution Ave. But I would not expect those concerns to ease much if unemployment stayed constant or even rose given the pace of job growth. Given the Fed’s view of labor force growth, they will expect that a payroll gain near the consensus indicates continued downward pressure on unemployment: Until job growth slows to something close to 100k a month, the Fed will anticipate further unemployment declines. Hence why it would be much easier for policymakers to use the weak inflation numbers as reason to pause if job growth looked to be trending much lower on a sustainable basis. But if anything the opposite is true – the economy appears to have some considerable momentum behinds it and is likely to rack up a third consecutive quarter of 3+% growth as the year ends. This suggest continued demand for labor. Obviously, the Fed would like to see something on the higher end to help confirm their estimates of full employment. 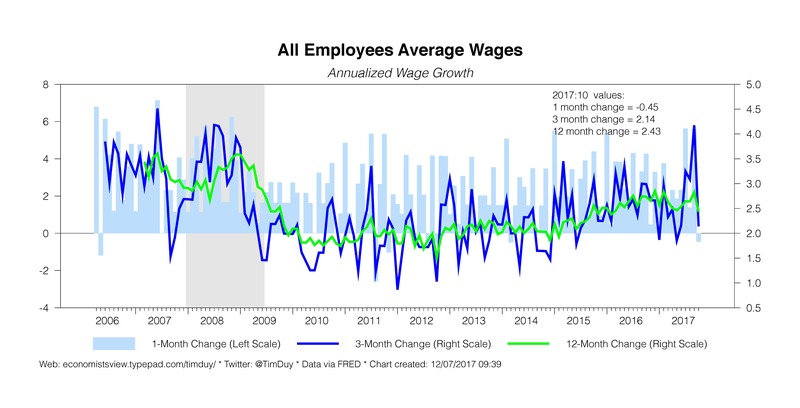 But even if they don’t get higher wages, they will anticipate wages gains will eventually accelerate as long as unemployment is poised to remain on a downward trend. Bottom Line: The Fed would have an easier time paying attention to the weak inflation numbers if the economy has not operating near their estimates of full employment and clearly growing at a pace that will soon surpass those estimates. Consequently, a report near consensus expectations will tend to strengthen their resolve regarding further rate hikes. A report that falls short of consensus, however, would likely be deemed as noise given the generally solid path of economic activity this year. Will Growth Slow In 2018? And Why? I think the economy is doing very well. I think it continues to show strength. The second half is looking like very good growth: 2.5 to 3 percent growth. And this is to be measured against our assessment that sustainable growth is more like 1.75 percent. So 2.5 to 3 percent is very strong growth, which should continue to lead to improved labor market activity. Unless something structural improves to increase trend growth, we’re going to be decelerating to something under 2 percent — and that will still be a pretty good economic picture. On the surface, this is a fairly straightforward analysis. The supply side of the economy currently grows at roughly 1.75 percent. The demand side is growing at 2.5-3 percent. So it must be true that activity slows to something under 2 percent. Indeed, this basic story forms the backbone of monetary policy decisions. Essentially, the economy currently operates at or near full employment, the current pace of activity will take the economy well beyond full employment, and thus the economy must slow to prevent overheating. The question I have is what does Evans believe triggers this slowdown? That question gets at the heart of the interest rate forecasts for 2018. Does this slowdown occur endogenously as the result of the economy running up against supply-side constraints? Or is it the lagged response of past monetary tightening? Or is further monetary tightening required to restrain growth? I think our policy moves to date have been thoughtful and reasonable. We’ve increased our funds rate objective by 100 basis points. 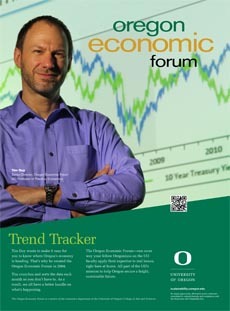 Maybe it’s time to stop and see whether inflation expectations are going to move in line with our 2 percent objective. And if the judgment was that we’re still likely to be underrunning our 2 percent objective, maybe we would stop briefly and assess for more information, maybe wait until mid-2018. In short, the Fed has already done a lot, growth likely to slow, and inflation is a mystery, so why hike now? But if your answer is the third option then you believe that the necessary (at least in the Fed’s view) tempering of economic activity will only occur after additional monetary tightening. In either case you eventually get a slowing of economic activity. But the path of short term rates looks very different. I think the majority of Fed policy makers fall into the third category, and thus are more likely than not to see the solid growth of the past three quarters as a signal that the economy will overheat without the projected additional rate hikes in December (25 basis points) and next year (75 basis points). Which is why I expect that as long as the economy looks likely to drive unemployment rate lower, the Fed will remain biased toward hiking rates.